Hardik Pandya's all-round flamboyance complemented by Mahendra Singh Dhoni's customary calm enabled India to record a comfortable --run win over Australia in the rain-curtailed opening ODI of the five-match series at Chennai on Sunday. Chennai: Hardik Pandya's all-round flamboyance complemented by Mahendra Singh Dhoni's customary calm enabled India to record a comfortable --run win over Australia in the rain-curtailed opening ODI of the five-match series at Chennai on Sunday. Courtesy Pandya's blistering career-best 66-ball 83 and Dhoni's 79 off 88 balls, India posted a competitive 281 for seven despite losing the top half for less than 100 after opting to bat. However intermittent showers during the break played spoilsport as Australia were set a revised target of 164 off 21 overs via Duckworth-Lewis- Stern method. Chasing the target, Australia did not have the best of starts and kept losing wickets at regular intervals with Pandya (2/28) helping himself with a couple of wickets. The young wrist spinners -- Kuldeep Yadav (2/33) and Yuzvendra Chahal (3/30) then ran through the middle and lower order as India took a 1-0 lead in the five-match series. For Australia, Glenn Maxwell made a quickfire 39 off 18 balls while James Faulkner remained unbeaten on 32 off 25 deliveries but that was't enough for the visitors. Earlier, Pandya career-best knock and Chennai's resident 'Super King' Dhoni's 100th international half-century propelled India to 281 for 7. Pandya and Dhoni scripted a brilliant recovery act after India's top-half was blown away for only 87 runs -- courtesy some controlled swing bowling from Nathan Coulter-Nile (3/44) and Marcus Stoinis (2/54). The duo added 118 runs for the sixth wicket with Pandya taking the attack back to opposition with some brilliant sixes while Dhoni once again played the role of sheet anchor to perfection. 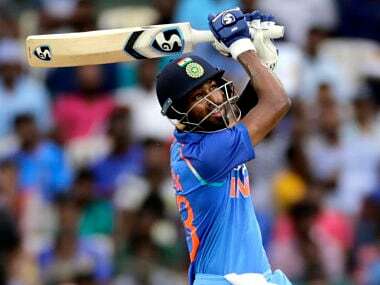 Pandya's 66-ball innings had five boundaries and five sixes -- four of which were hit off leg-spinner Adam Zampa's over. Dhoni on his part hit four boundaries and two sixes -- both coming down the track and lofting over extra cover off pace bowling. The former skipper played 88 balls. The two sixes were the kind of shots that one doesn't associate with Dhoni -- maximums over extra cover. Dhoni also added 72 runs for the seventh wicket with Bhuvneshwar Kumar (32 off 30 balls) in only 8.5 overs which took India beyond 280 plus total -- something that looked unlikely at the halfway stage. The turning point of the innings was the 37th over bowled by Zampa (1/66 in 10 overs) when Pandya launched into him. India were 148 for 5 at that stage and the pressure was on Pandya and Dhoni, who were trying to rebuild the innings. 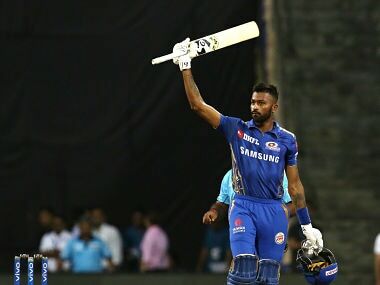 Pandya started with a boundary off a full toss and followed it up with three huge sixes as 24 runs came off that over. Australian bowling attack suddenly felt the pressure after that. 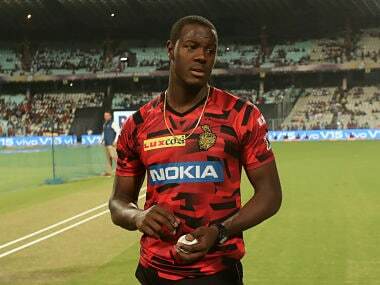 Earlier, Coulter-Nile making a comeback to the team after being dropped from Australia's Champions Trophy squad, made early inroads by removing Ajinkya Rahane for 5. The Mumbai batsman didn't look very convincing in his brief stay. He was dismissed going for a drive off a swinging delivery from Coulter-Nile only to be caught behind by Wade. Skipper Kohli shaped for a drive and missed off the second delivery he received after having left the first one alone. 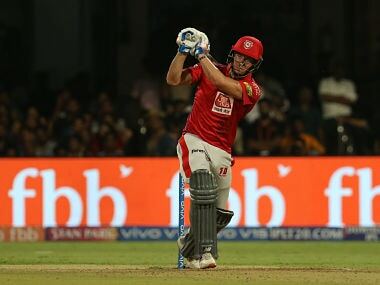 After playing the third towards cover quietly, the captain was on his way after being snapped up the athletic Glenn Maxwell at point going for an expansive drive off Coulter-Nile. Maxwell did well to time his jump and take a one-handed catch to cut short Kohli's stay at the crease. Manish Pandey, who got the nod ahead of his Karnataka state-mate KL Rahul, lasted just two balls. He was out fishing at a delivery on fifth stump. India were in dumps at 11 for 3 when Rohit Sharma (28) and Kedar Jadhav (40) revived the innings with a 53-run stand. Both were out trying to pull short deliveries from Stoinis before Pandya-Dhoni took over.